Ready to lift a bus, dump truck and some truly heavy farm equipment? You may just need the HDS-18E, BendPak’s 18,000-lb. capacity four-post truck lift. This massive lift is also ALI Certified, offering superior protection and backup safety measures for heavy-duty lifting. BendPak's HDS-18E four-post lift is engineered to make light work out of heavy lifting. It’s built to last and features upgrades that increase safety, durability and productivity. This is the lift that graduates from the class of mid-size trucks, vans and SUVs up to heavy-duty applications. This is a professional car lift that can even handle some industrial and farming equipment. It’s also lighter-duty than other lifts in the truck-weight category, so it’s not overkill when you don’t need, for instance, 20 tons of lift capacity when 9 tons will do just fine. To accommodate long wheelbases, the HDS-18E offers extended runways that are ​249” front-to-back. This is the first of the heavy-duty models to offer extended runways. All 27K, 35K and 40K lifts are built this way. Better-gripping runways ensure the massive tires on your massive vehicles stay put. If the runways gets slick, their treaded surfaces are still able to grab the wheels without damaging or marring them. 12" x 12" base plates don’t just provide a solid foundation, they inspire the confidence to work on virtually any-size vehicle up to the rated weight capacity. Supersized 12” diameter cable sheaves within the runway and cross tubes, combined with massive 4” diameter sheave axles, dramatically improve cable wear and critical component lifespan, meaning this car lift increases your safety, so you spend less money in service-related expenses down the road. The HDS-18E four-post lift features four galvanized lifting cables that do an excellent job of providing abrasion resistance and preventing fatigue. Spring-loaded safety locks automatically engage continuously during rise, and adjustable safety ladders allow for precise runway leveling, even if the posts have been installed on slightly sloped floors. A secondary lock system is on constant guard and acts as a slack-cable device in the unlikely event of an unexpected cable failure. Only consider a four-post lift that offers this secondary lock system. Lifting cables, airlines, safety latches and sheaves are all fully enclosed within the structure. 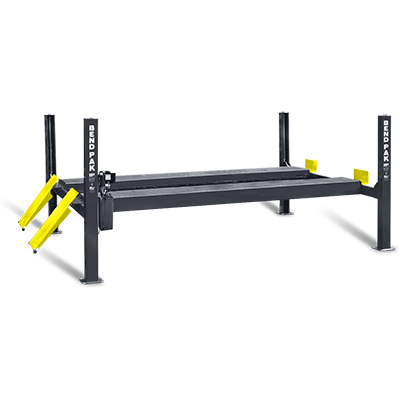 Features adjustable locking positions for variable-height parking and infinite leveling. A maintenance-free electric-hydraulic power system assures ultimate dependability. Despite its size and lifting capacity, all controls on the HDS-18E four-post lift are conveniently located within easy reach. Rolling jacks are used to raise the front or rear portion of a vehicle off the car lift’s runways, allowing operators to perform efficient wheel and brake service. A pair of jacks allows the entire vehicle to be elevated. Each jack has telescoping arms and frame contact pads that can be extended over the runways and positioned under vehicle lifting points. Each jack features three safety-lock positions and stackable truck and van adapters for increased lifting height and better access to frame contact points on high ground-clearance vehicles. The jacks come equipped with a commercial-grade air-hydraulic pump.